BusinessWeek's Ian Rowley is drooling over Japanese handsets Here - and who could blame him? However, his reasoning as to why these pocket rockets "seldom make it overseas" is just a bit off. "Most of the world won't get the chance to buy these handsets. Japan's superphones seldom make it overseas. One reason: Many phone users would be unwilling to pay as much as Japanese do for their monthly bills - $60 on average. Before long, though, much of the new technology, if not the same handsets, will likely find its way out of Japan." Market trends with a positive impact on the total figure in FY2006 were robust IP and fiber optic markets pushing up shipment of routers, LAN switches and digital transmission equipment, expansion of cellular phone services, increasing demand for base station communication equipment, and the growth in multipurpose office equipment as businesses aim for improved efficiency and compliance. However, the figure for cellular handsets is expected to have remained the same as FY2005, leading to the FY2006 forecast figure of 4.332 trillion yen, a relatively flat growth over the previous year. A recent report focusing on the faltering Korean DVB-H market lead us to wonder how the user experience, and business model, compares with the service launched here in Japan on April 1st. Several items stand out as either very similar or completely opposite. Many studies over the years point to the fact that mobile user habits vary much less from region to region than assumed by most industry pundits. Of course there are at least some notable differences, however - by and large - people are people, and in-depth research has routinely shown common ground across cultures and classes. Shares of Sanyo Electric Co., the world's largest maker of rechargeable batteries, fell to a 31- year low after 1.3 million of its cells used in mobile phones were recalled on concern they overheat and rupture. The lithium-ion batteries, made by a unit of Osaka-based Sanyo, are used in Mitsubishi Electric Corp. handsets on NTT DoCoMo Inc.'s high-speed service. Matsushita Electric Industrial Co. confirmed it found six cases of burst batteries used in its Panasonic phones, responding to a Yomiuri newspaper report [see Japan Times in English]. Matsushita spokesman Junji Kanegawa said Sanyo wasn't the battery maker, declining to name the manufacturer. For the last four years now, KDDI/au has been setting the pace in Japan for mobile music services, launching the first mastertone service in 2002 and the first full-song download service two years later. The company has recorded a total of over 38 billion mastertone downloads and 78 million full-song over-the-air downloads. They have also achieved impressive handset sales, with more than 22.8 million mastertone-capable and 10.4 million full-song-capable KDDI mobile phones sold in Japan. At a recent press conference in Tokyo, the wireless operator raised the bar yet again - unveiling plans for its upcoming digital radio launch and introducing the latest incarnation of its LISMO! music service. NTT DoCoMo and Mitsubishi Electric announced today, at a hastily called press conference, that some D06-series batteries, which were manufactured through May 2006 and installed in the D902i-series handsets, could generate excessive heat and possibly rupture during charging if the batteries have been subjected to a strong external impact. The companies estimate that some 1.3 million D06 series batteries were manufactured through May 2006. Sales of the D902i, D902iS and D903i have been suspended for the time being. According to an article on the Financial Times, SoftBank Mobile quietly changed the standard subscriber accounting procedure in October. Their 'new method' resulted in numbers which saved the company from having to announce a net loss of customers during their debut month. "The telecommunications group was able to report a net gain in subscribers only by extending the period for which it counts inactive users from six months to a year.. this allowed it to include prepaid subscribers who had not used their mobile phones for nearly 12 months. Japan's other big mobile operators generally use three months as the cut-off period.". We had speculated they would post a net loss in October -- the TCA numbers for November will be released soon -- Stay Tuned. Asia's largest alliance of mobile operators, as announced April 2006, today welcomed Smart Communications, Inc., the Philippines' leading mobile operator, into the fold. With SMART's participation, the group has expanded its coverage footprint to over 130 million mobile subscribers in nine countries and regions. In conjunction with the introduction of its newest member, they have also announced the new official name - Conexus Mobile Alliance - and launched this new website, as its members begin to roll out value-added roaming and corporate mobile services amongst each other. Naviblog Japan was featured on Dreamgate, a Japanese government-supported organization, with the motto "Rise Up Japan" and that holds as its mission to nurture entrepreneurship in Japan. 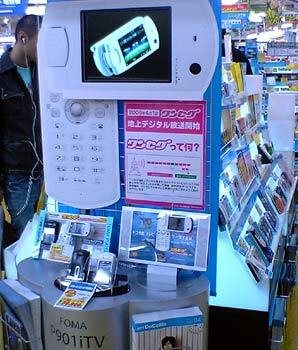 Found in the "Possibilities for Mobile Business" area within the "Fast Navi" section, Naviblog was featured in a marathon 5-article piece, the interview and article were authored by Kenichi Nakaya who has been involved with the mobile industry since the early days of the i-Mode. We have Naviblog's presentation at Wireless Japan 2006 on Video Here.